The 23-year-old singer's music has taken a different direction this year (17) and any mention of One Direction has been removed from the publicity for his upcoming BBC documentary. Harry, which will be broadcast in November (17), will solely concentrate on the singer's life after One Direction. The hour-long special will also feature Harry talking to his friend and BBC DJ Nick Grimshaw and performing tracks from his solo album, Sign of the Times. According to The Sun, Harry wants to be taken serious as a credible solo artist and is keen for the media and the public to stop bringing up his boy band past. "The path Harry has taken with his music is very different to the type of big pop songs he was performing with One Direction," a source told the newspaper. "As a result, Harry is keen to get away from his teenybopper days and reinvent himself as a rock star." The documentary will briefly mention One Direction but Harry's pop past is not a significant factor in the programme. The news will comes as a blow for One Direction fans, who were hoping to see their heroes back together at some point this year. The band announced a hiatus in 2015 and took a break from each other at the end of that year, with Harry suggesting the break would be about 18 months. 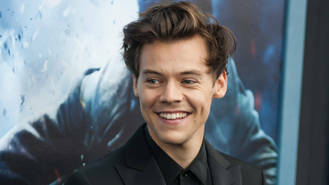 He and his bandmates have all gone on to taste solo success and Harry made his movie debut earlier this summer (17) in director Christopher Nolan's war movie Dunkirk.